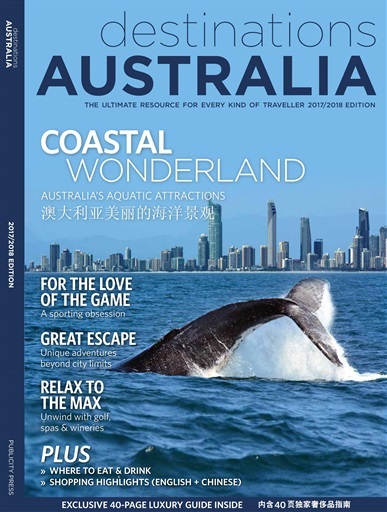 Destinations Australia celebrates the best Australia has to offer in shopping, dining, travel, dining, fashion, arts and entertainment. Key stories are translated into Chinese, and features include a 40-page luxury guide highlighting indulgent shopping, dining and spa experiences. You’ll find Destinations Australia in the guest rooms of 4-5 star hotels nationwide and Qantas lounges from Australia to Singapore, Hong Kong to LA. 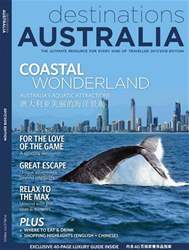 This issue looks at Australia's thrilling coastal experiences – from island hopping to whale watching and swimming with manta rays. We round up some of the nation's most exciting sporting events, and head out on regional escapes, from gourmet adventures in Kangaroo Island to hiking Tasmania's South West National Park. What's more, our favourite local heroes share their favourite haunts and happenings, from Sydney comedian Tim "Rosso" Ross to Melbourne nail polish maven Anna Ross of Kester Black and Gold Coast style guru Susie McWatt Forbes.